I feel so proud of Penny words can't quite express it. 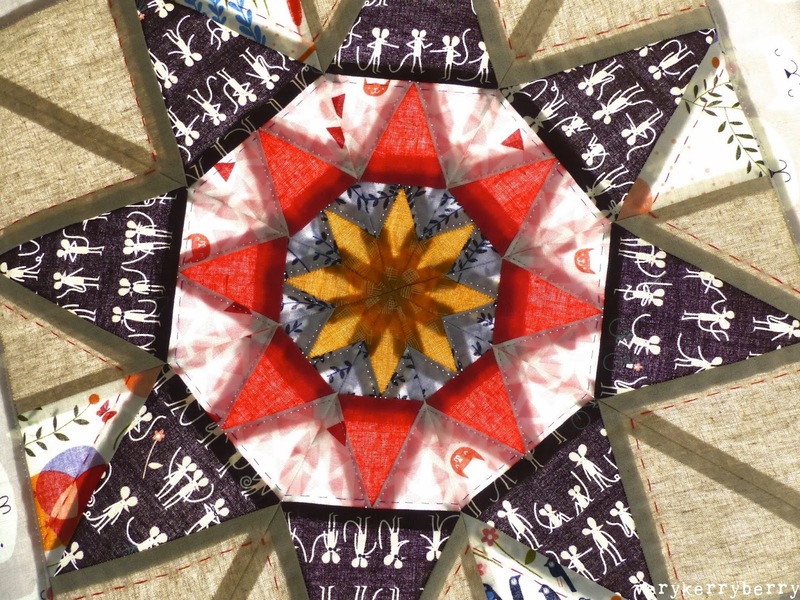 Her new book, The Paper Pieced Home is an utter pleasure from the moment I opened it. I had seen some of her designs as she was writing it but many were new to me and I smiled a big happy smile as I turned the page from one perfectly realised retro quirky design, to another and another and another. It's a book of wit and wisdom. 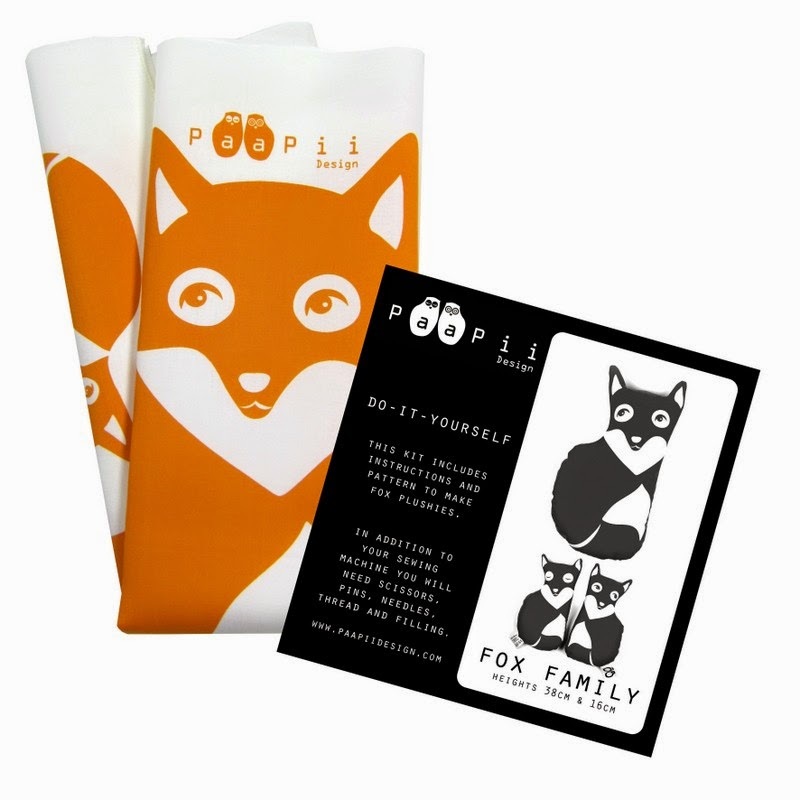 Clever, funny designs and detailed instructions- the how to, equipment, fabrics etc. its 'll there and nothing is skipped over. The layout is spacious with a mix of drawings and photographs, great fonts, beautiful graphics and fabric snippets throughout. The popper push toy was the first design I saw as the book fell open and before I saw the title, I instantly knew what it was and I laughed- such a fun retro toy to include. 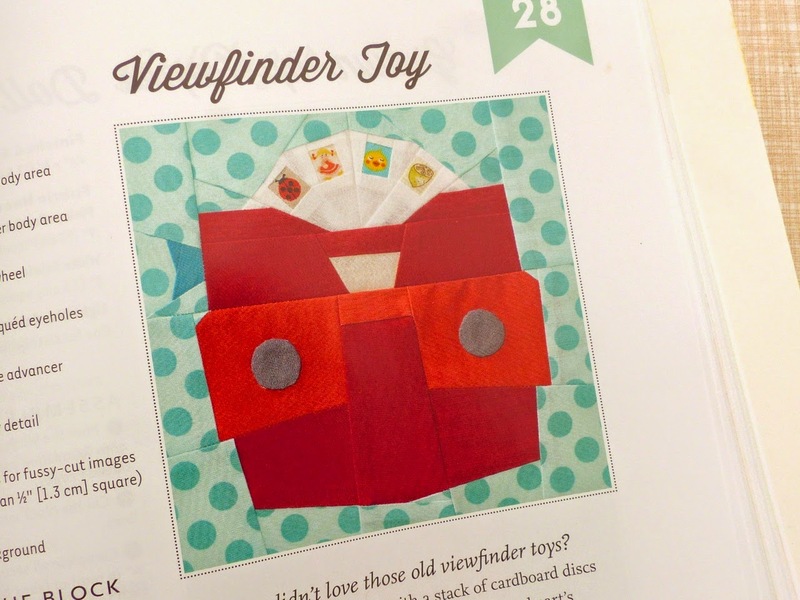 A viewfinder is a hard item to design a paper piecing pattern around- all those angles in a contained space and Penny has done a lovely job. 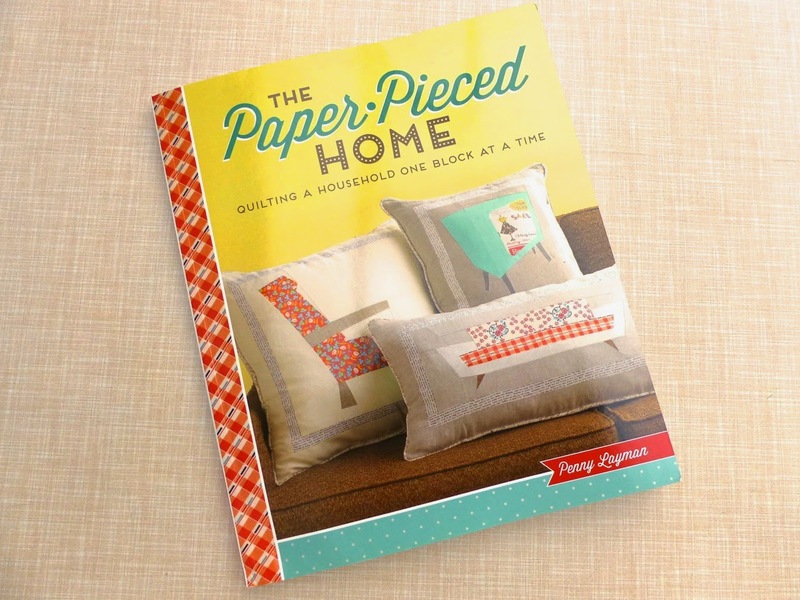 We think in very similar ways when it comes to the technicalities of paper piecing and where the design and construction lines should go and I love how she has done this. All the construction lines for the different sections complement and work with the design lines of the viewfinder itself. The Saucepan is one of my favourites because the fabric choices are such a joy and I love the angle of the handle and I love kitchenalia. Next the Lion! 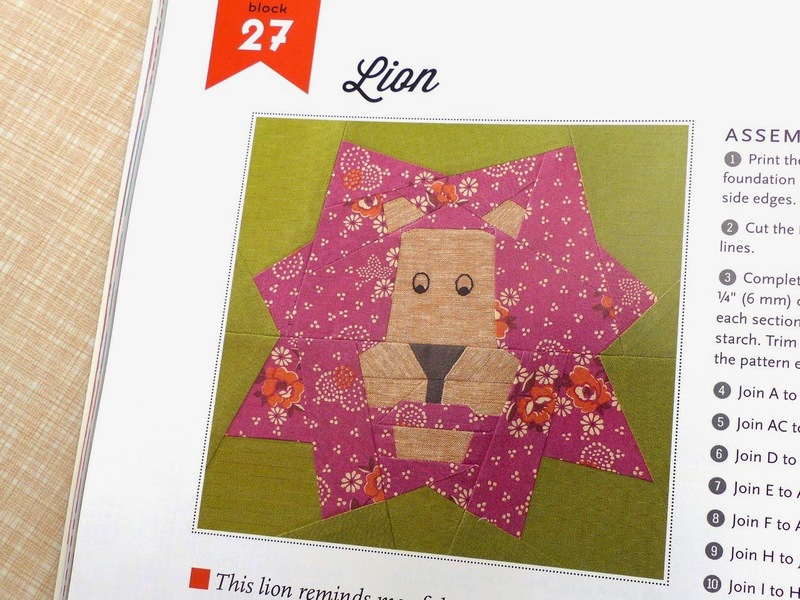 This reminds me of so many 1970s craft book lion toys with a looped wooly manes. It also reminds me of Parsley the Lion- anyone else remember him? And the Chives? I am itching to make him. 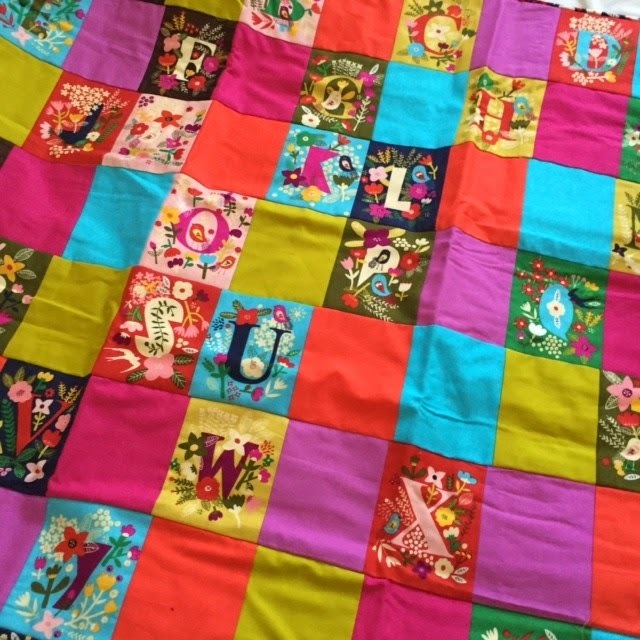 There is an alligator quilt that I saw during the book writing process that I also love- I can see them together in a nursery quilt. 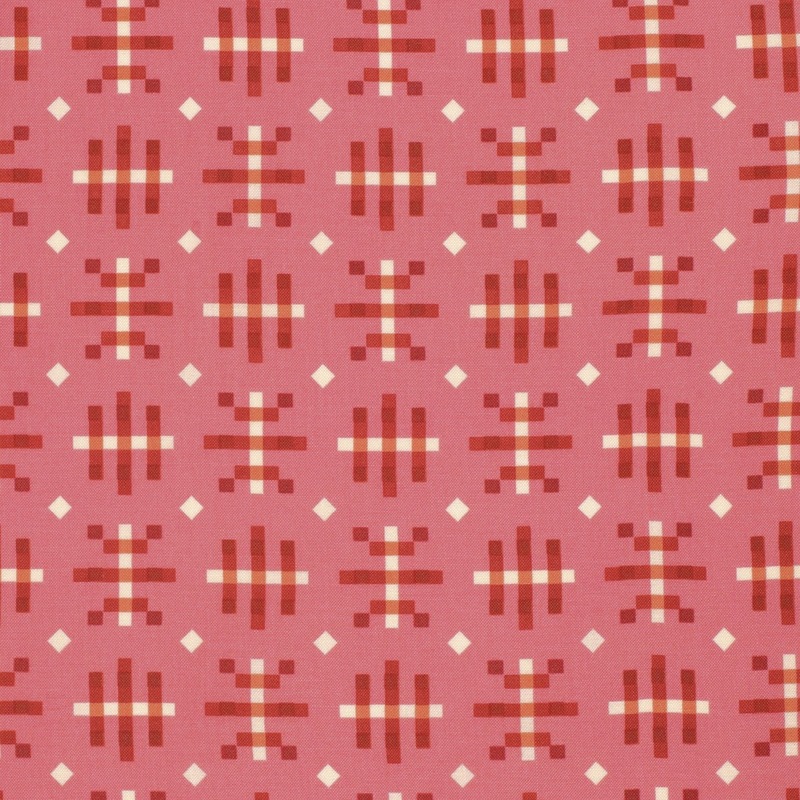 Many of the 'Playtime' section designs would work in baby quilts, both singularly and en masse. 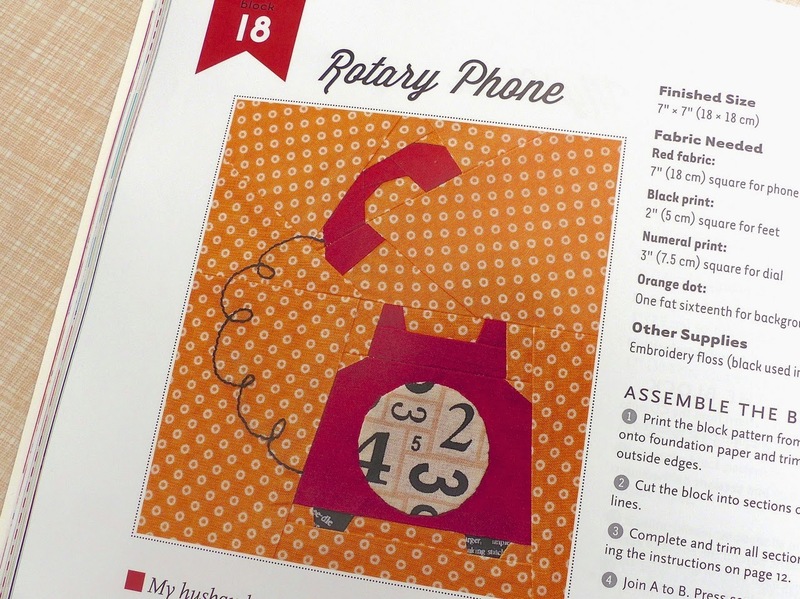 Many of the designs like the Rotary phone have a dynamic element with unusual angles, implied movement and a great use of perspective. It is what makes the designs sing. I could go on, there are so many other designs I would pick- the lamp, the cast iron skillet, and the 70s flared pants for starters. 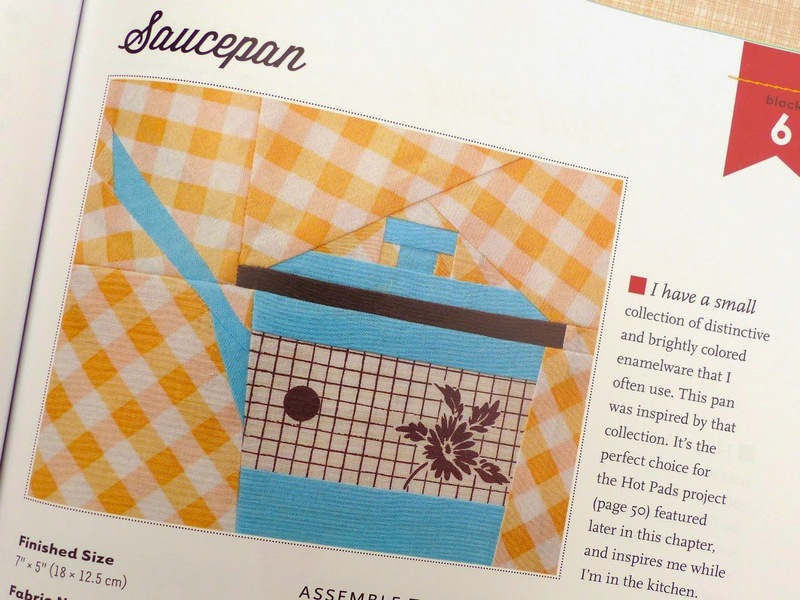 The book divides into themed sections e.g Kitschy Kitchen, Wear it! and Retro Home and each section has accompanying projects. 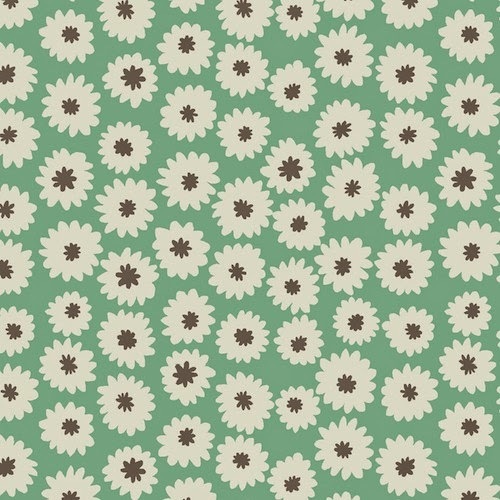 The block designs come on a CD of 50 printable template patterns- no need to fret about photocopying. My January visit to Eternal Maker has timed nicely with the new arrival of a couple of very pretty and usable fabric ranges. Starting with Handcrafted by Alison Glass. Bouquet in Yarrow. 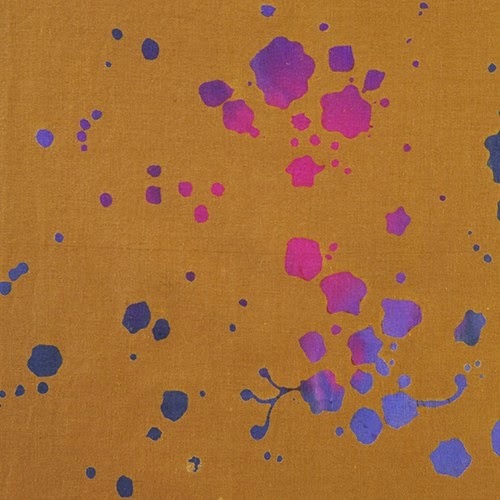 I am not sure what it is about this particular combo but the two mustard gold and the purples make my heart sing! Plus in Strawberry. 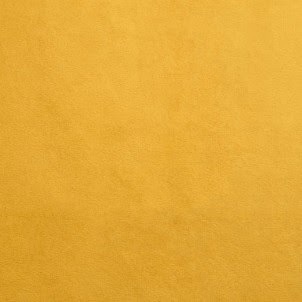 There is a beautiful softness to this colour combination. Penny in Fossil. Like all the prints, the simplicity is everything. 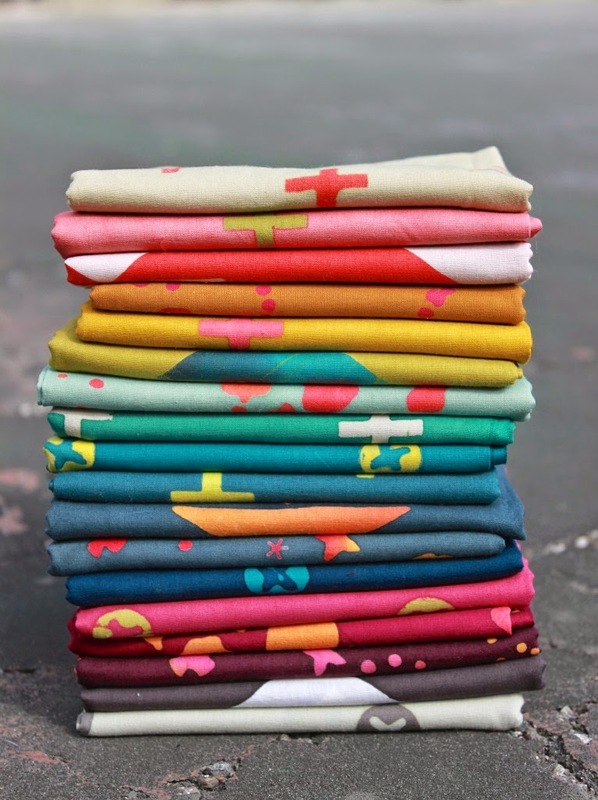 I have seen a lot of items made up in these fabrics- the colour range lends itself to rainbows easily. 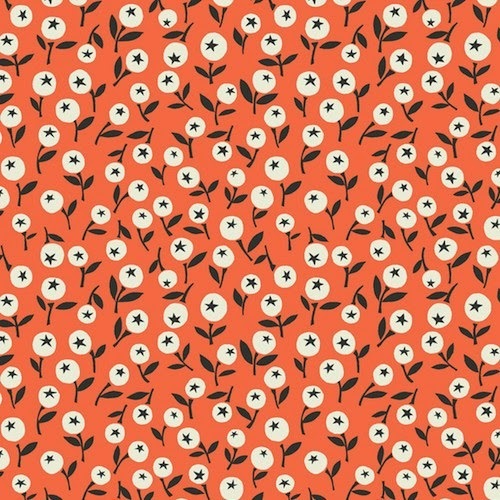 It would make lovely quilts and small zip pouches. I have also seen it used for bags. It is a little lightweight for that- I don't think they would wear well. And as for clothing, it really does look stunning. 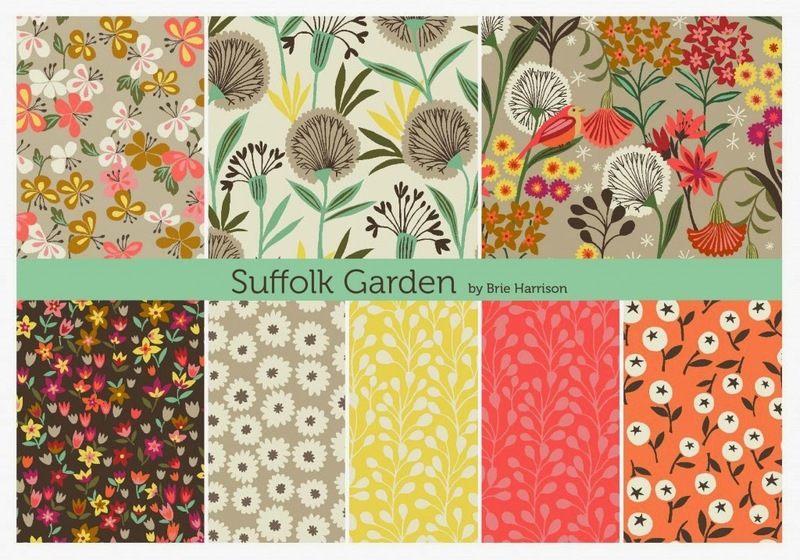 Suffolk Garden by Brie Harrison is a new collection from the UK based company Dashwood Studio and has just hit the shelves at Eternal Maker. 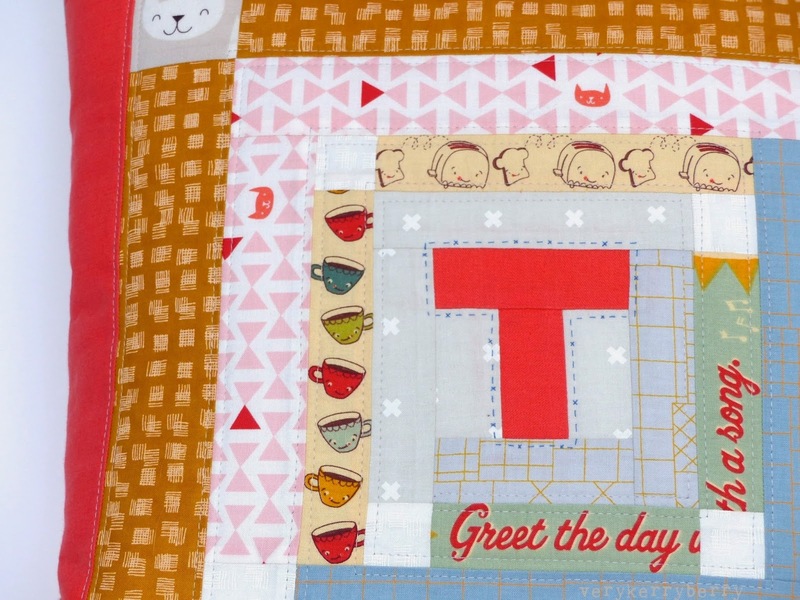 There is a new kit available, Petite Fleur alphabet cot quilt kit. 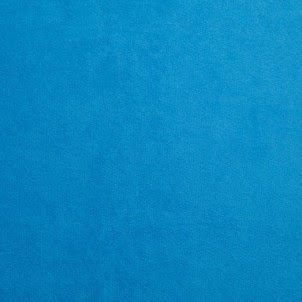 Everything you need to make the quilt top is there, you will need to supply backing, wadding and binding. For the knitters and crochet fans, lots of new yarn has arrived. Debbie Bliss is one of my favourite names from my knitting days. Her yarns are such great quality and the baby yarns are especially soft. 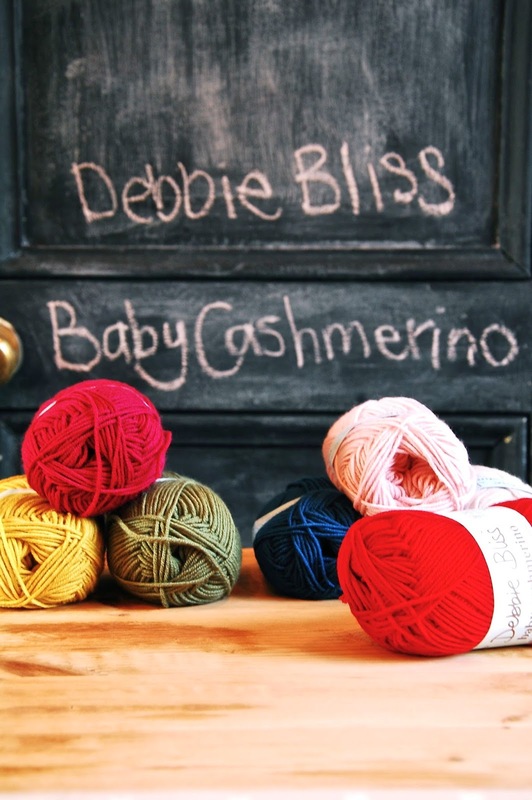 There is Baby Cashmerino and Cashmerino Aran both in an amazing range of colours. 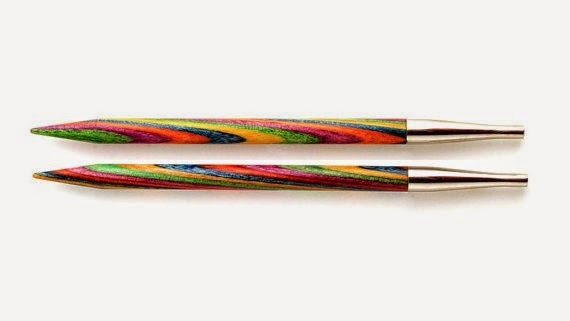 You will also find Knitpro interconnecting needle tips/cable range. If you are a knitter, I am sure these will look familiar. Enjoy looking at the new stuff, and for those of you on Instagram, you may want to follow the Anna on the @eternalmaker IG account as bolt ends pop up on there! 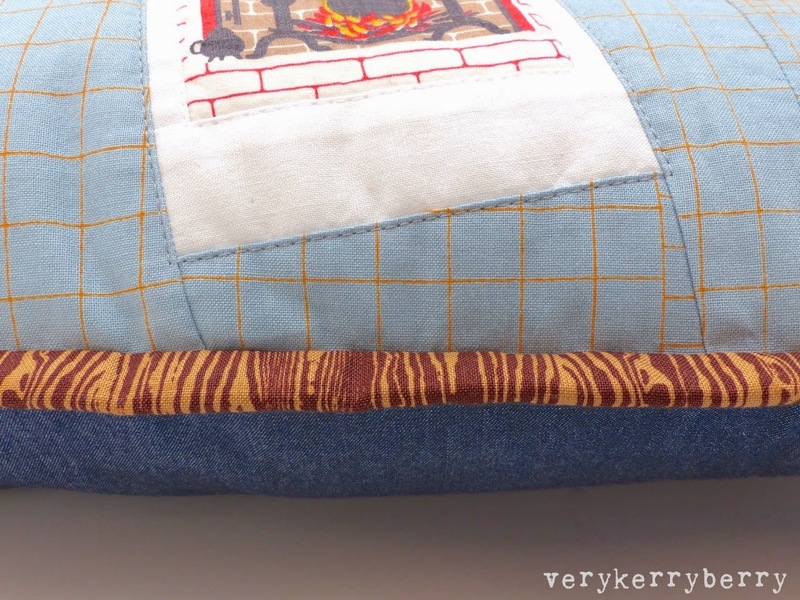 Winter: a great time to make and gift pillows. not a great time to take photos of them. 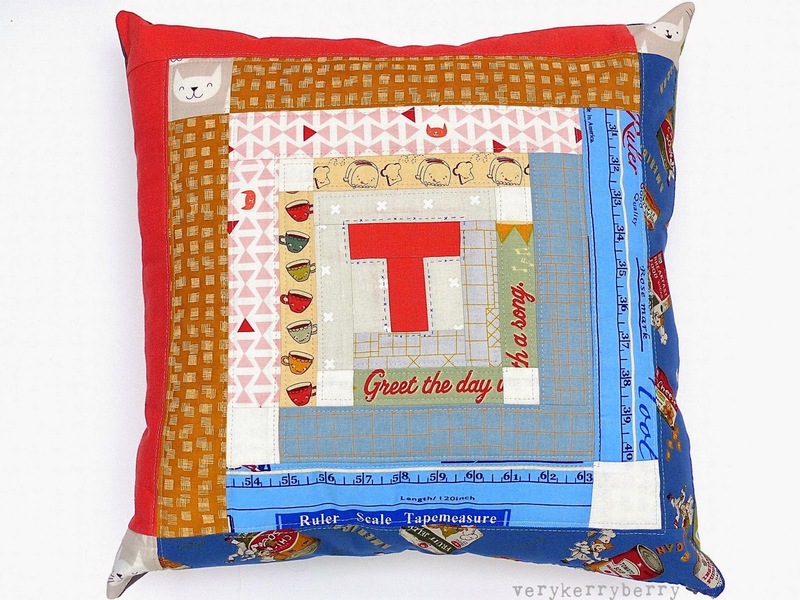 This 'T' pillow is a 20" square informal log cabin design with a few extra squares. I designed it on Touchdraw to get the colours and proportions before I cut. It was a Christmas gift, requested by my nephew. I made my mum a 'Drawn Together' pillow using Sarah Fielke's pattern in 'Little Quilts'. I must have forgotten to take a finished pillow picture! It is foundation paper pieced. 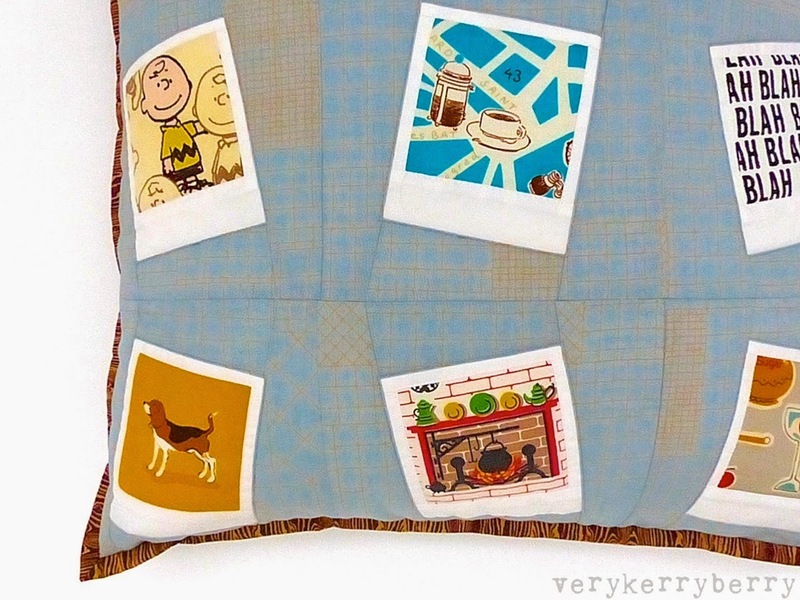 And this pillow, which was a pleasure to make (and a nightmare to photograph) was for my friend Kathy. It celebrated her birthday and some shared memories with polaroid snaps on a formica style background. The first person I saw make this polaroid style block was Corey- Little Miss Shabby, way back in the Ringo Pie Bee. I made these these same size as a real polaroid. 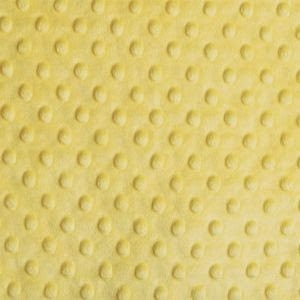 It is a great block to paper piece and obviously, it is a fussy cutter's perfect block. 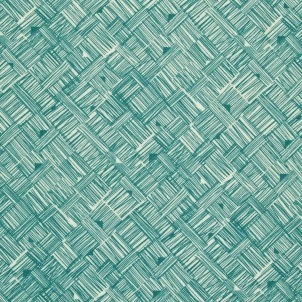 The background fabric is Doe, Intersections in Sky. The binding is Joel Dewberry's Woodgrain in Bark. The bonus is these pillows are all within walking distance of my house, I can visit them whenever I please! 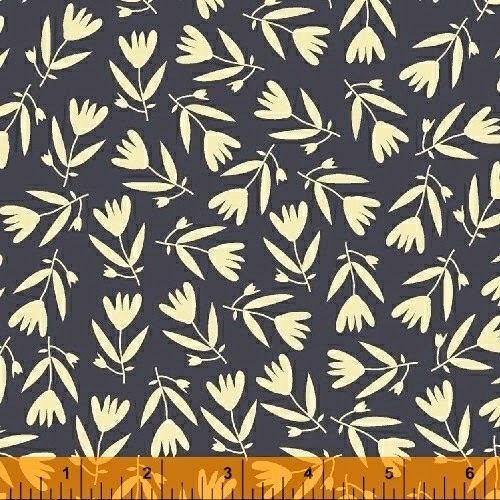 This fabric has an extra deep pile, I think it would make a lovely pet bed! 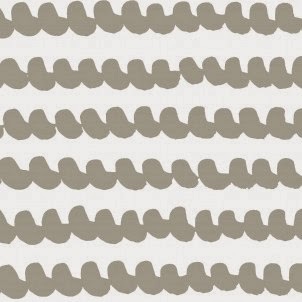 I really like the classic dimple plush fabrics too. Sewing with Plush is different to quilting cottons. 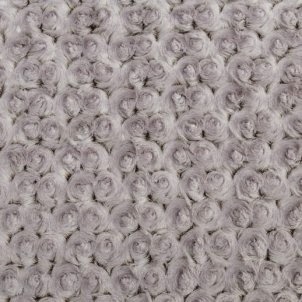 Plush tends to be 100polyester, doesn't need pressing and doesn't unravel. It can stretch and as it is thicker and can slip so it needs different handling. 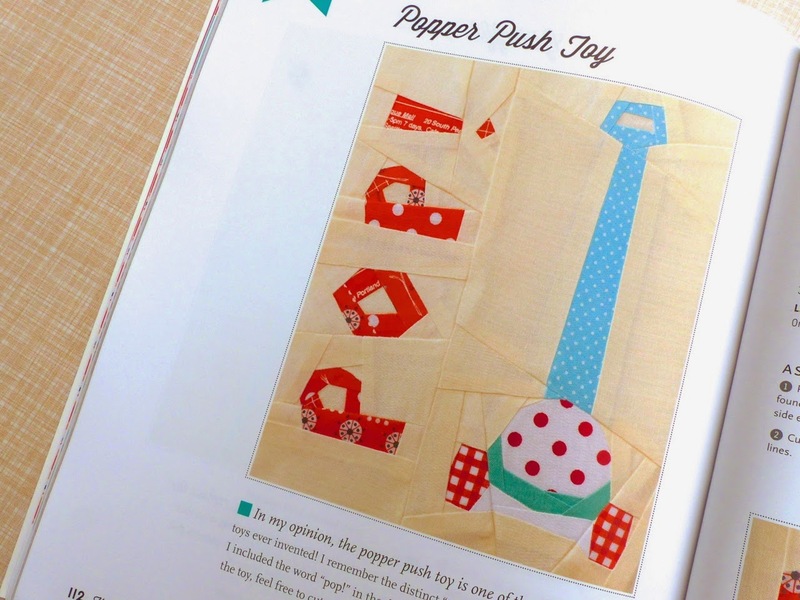 Read Kellie's fabric guide to plush here. She also recommends Clover Wonder Clips rather than pins and size 90 ballpoint needle (back in stock soon). 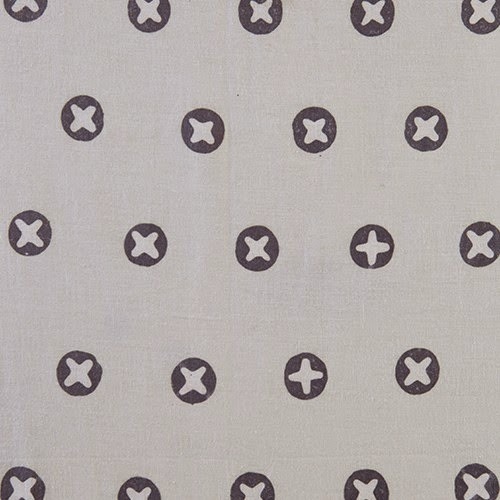 There are louder prints in the collection but this simple cross hatch is one I would use a lot and it would work very well as strips- sashing, a border or binding. 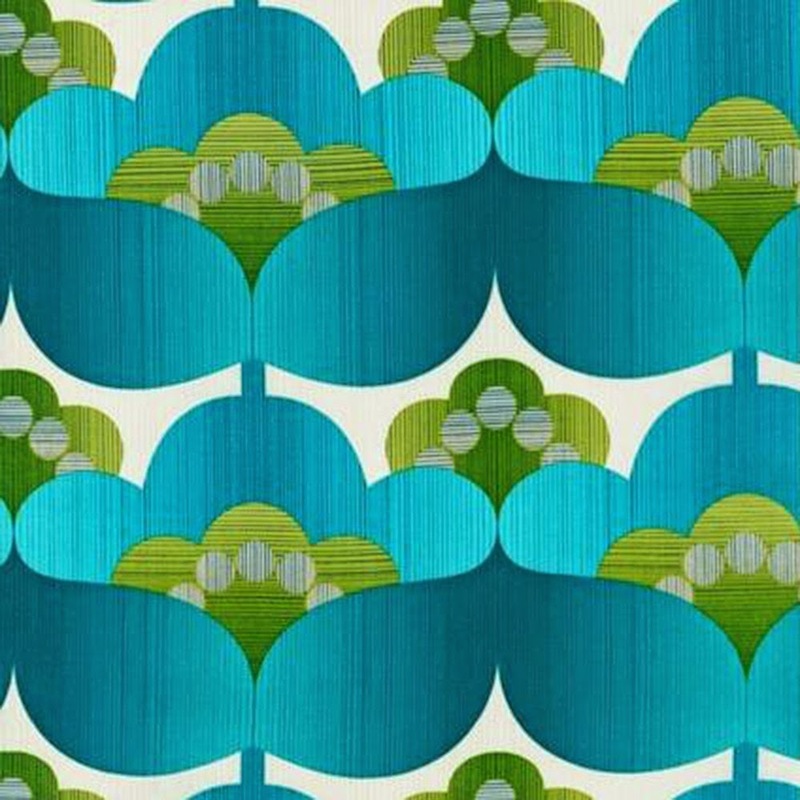 It would make an amazing lampshade! 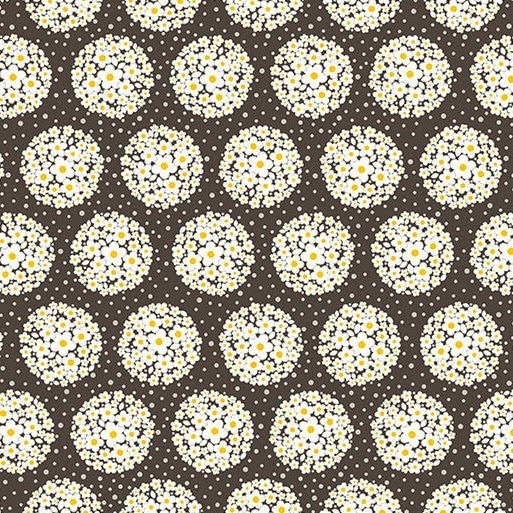 Find a lampshade kit here. A long ¼ yd or metre will be enough for this side lampshade. 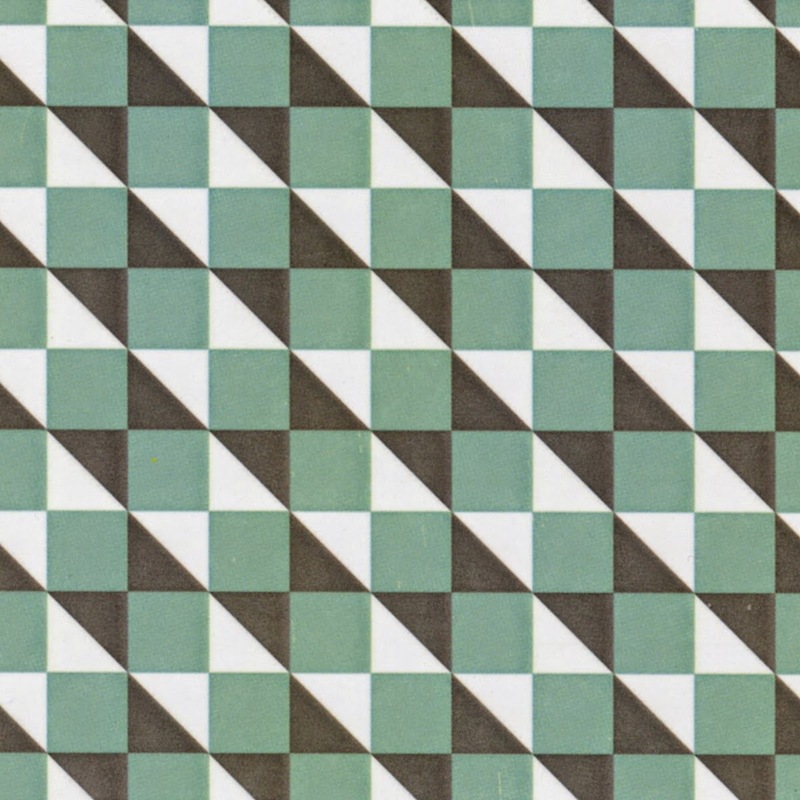 There are other prints in the Mod tex range. 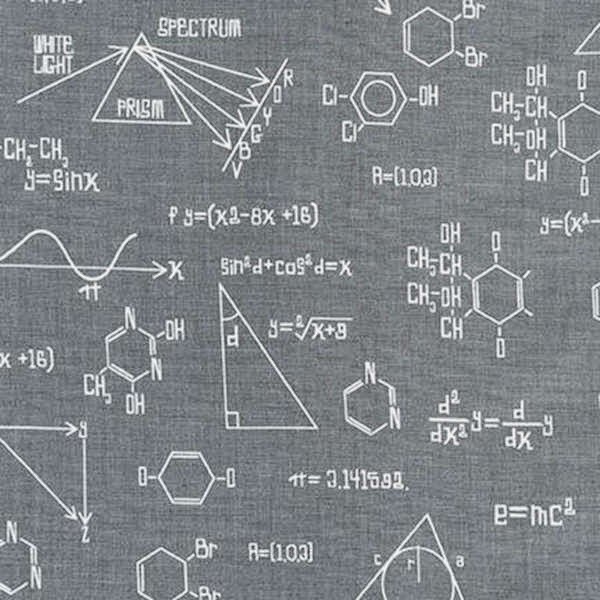 This has to be the perfect fabric for the math's obsessed geeks and Big Bang Theory fans in your life- that could include yourself of course! I love the computerised font. 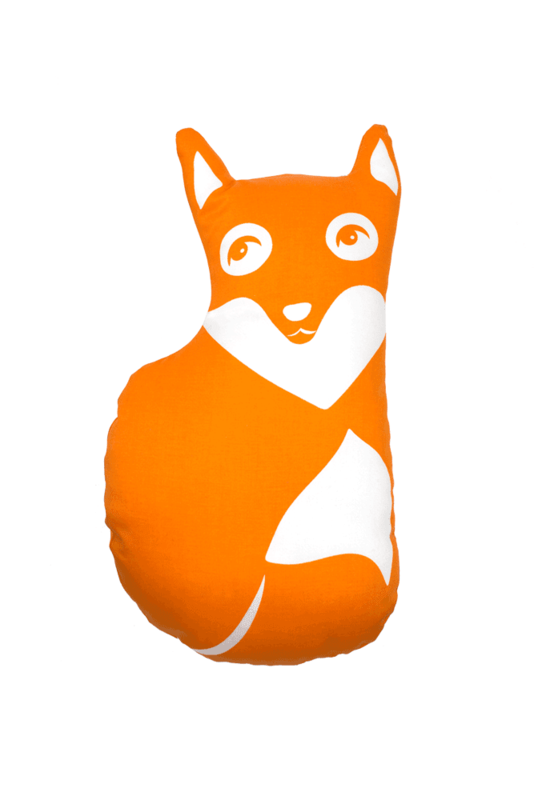 It makes one large (38cm) fox and two smaller (16cm) foxes, each with a slightly different facial expression. 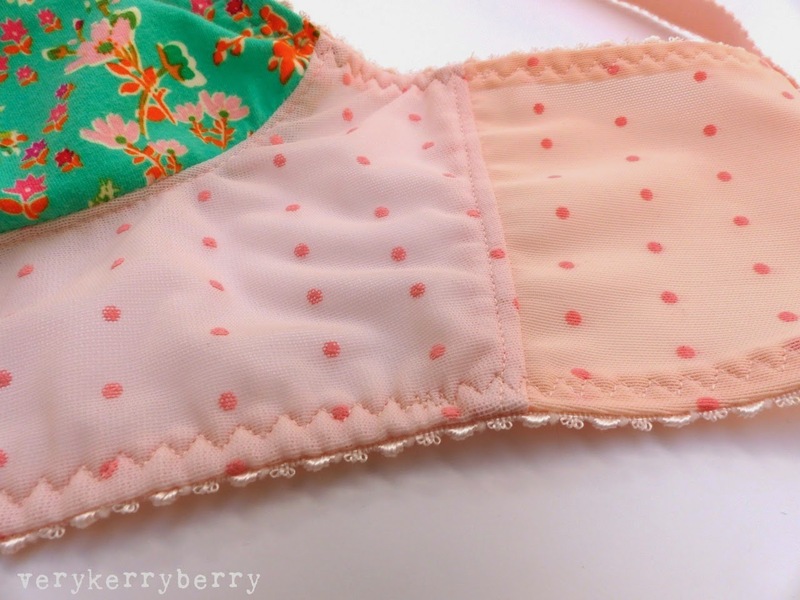 Lingerie making has long been a sewing specialism I have wanted to explore. After some tentative attempts at knickers I made a cami slip and briefs following Gertie's sew-along last year, I made test garments and altered the fit and the resulting undies have been worn many times. When I saw Amy Chapman's Watson Bra on instagram last December, I knew this style was for me. It is the perfect pattern to dip your toe into bra making without yet entering the world of the underwire. There is a sew-along just starting now but you don't necessarily need it. 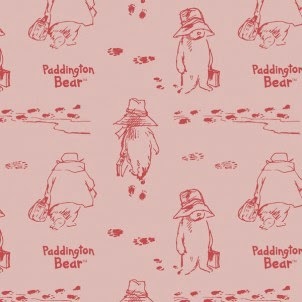 The pattern was quite detailed and there is lots of info at Clothhabit. You do need a machine that is happy sewing stretch materials and elastic- happy in terms of tension; the stitches are straight, zig-zag and three step zig-zag so suitable for a standard domestic machine. I did not use an overlocker/serger. 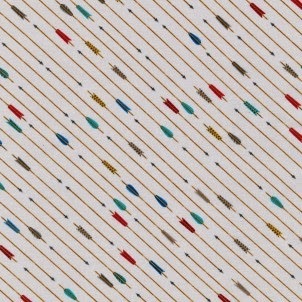 A multitude of stretch needles is a must. I always break a minimum of two when sewing anything with elastic or lycra. 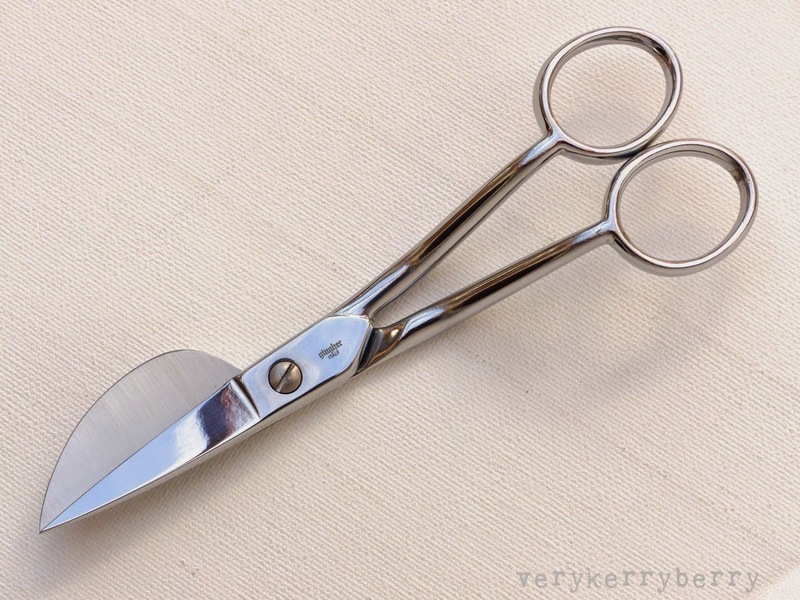 These came in handy: duckbill appliqué scissors. This pair were a Christmas gift from my brother so I asked for Ginghers! You can see a more cost conscious pair at Plush Addict awaiting restocking. The joy of these scissors is that you can trim away a layer of fabric without harming the layer beneath. I usually do this turning a small pair of scissors on their side which works but is not without hazard. This is a luxury method and makes trimming and grading seams a lot easier and safer for me. You can see how the duck billed side slides underneath the seam being trimmed and shields the lower layer, allowing you to trim closely. Nice! This area is the back upper elastic which leads into the bra strap as seen from the wrong side (above) and the right side (below). Sewing this bra was a teeth clenched experience. I measured myself as the pattern instructions stated but there is no fitting during construction. Instead you have to wait for the end product and cross your fingers! I was lucky, for a first attempt the fit is good, very wearable and I love the longline feeling- it seems to provide the feeling of security of an underwire bra with a lighter weight coverage. None of my shop bought bras fit well- they fit on the band around my ribs but tend to be big at the top of the cup and I worked out with this bra that my cup size is 34A at the lower part of the cup and 34AA at the top part so that will inform the next Watson and the underwired bras that are next on my list. Alterations: I removed a little fabric at the back to accommodate a 2-hook width fastening rather than a 3-hook. 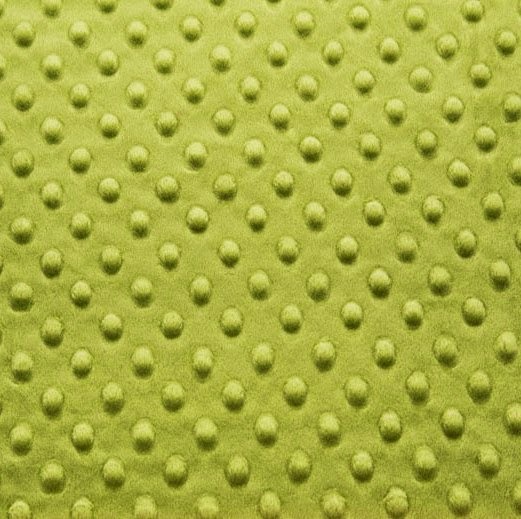 This is covered in the pattern. Top Tip: Print the patterns pieces on to card. It makes drawing round them and cutting out a lot easier. 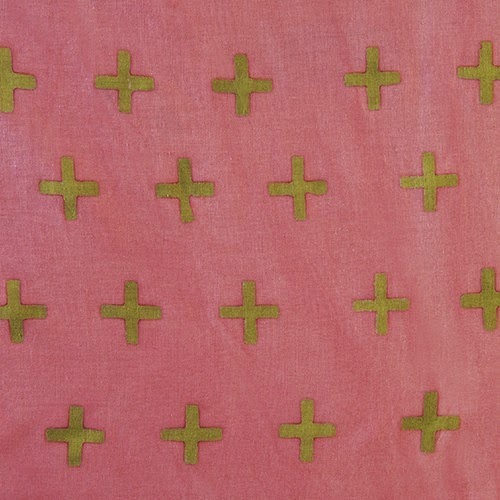 For more detail about the fabrics involved, look here at Clothhabit. I bought the Craftsy bra making class with Beverly Johnson and found her fabric information invaluable and the whole class is a joy to watch. Sewing Bras: Construction & Fit (w/ Beverly Johnson) (affiliate link). Thankyou to Sonia who shared some tips on Instagram (@fabricandflowersuk) and stressed the importance of sewing as close to the edge of the elastic as possible so the edging just peeps through. This bra seems to work in a huge range of sizes. Look at #watsonbra on Instagram to see the variety. Obviously the support and coverage is much lighter than foam cups and underwires but I was very happy with the result. It is the sort of bra I would wear under a shirt or jumper but not under a tighter fitting jersey top-I still prefer foam cups for those! My daughter has requested one and I definitely want more of these in my undie wardrobe. A note on supplies: frankly, it is very hard work and a total PITA in the UK to find your supplies in one place. You can either go to Bramaker.co.uk, Vena Cava Designs or English Couture. Selection varies and postage adds up. What you really want is a kit to make a Watson bra with the correct fabrics and findings but you may struggle to find that. I have bought kits from Merckwaerdigh, they tend to be quite brightly coloured but they do include all you need and even with postage from Holland, they work out cheaper than many UK options. You can find a good range of elastics and associated notions at The Bra Shop on Etsy- UK based. It does make me want to set up my own UK bra hobbyists supply shop but a small house, no spare storage and pets does not seem like a suitable environment!